Around the country in October 2014, the Fresh & Clean branches experienced the exciting Fresh Approach launch. Fresh & Clean branches were converted overnight to red carpet marquee events, with everyone arriving to the surprise of being welcomed to the new ‘Fresh” with pumping music, visual presentations, competitions, prizes and fresh breakfast catering. The Fresh Approach launch included the release of everything Fresh; the branding, the vehicles, the look, the focus and the new Fresh range of products and services. Efficient for service delivery – developed around proven dispenser technology with smart interchangeable service and design components. Complementary to customers’ washrooms in design and options (manual & hands free/auto) for washroom and workplace health & hygiene. Highly visible with new design and branding – who are we? – We are Fresh & Clean! The Fresh washroom and workplace dispensers and services now complete the range which began with the earlier launch (Newcastle and Perth in 2013) of the new Feminine Hygiene Unit – designed by women for women. For years sanitary units have been ignored by everyone except the people that use them – women. So when Fresh & Clean wanted to design a better unit we turned to the experts. Through research and company-run focus groups, we asked women exactly what they liked and what they didn’t like. We listened to their responses. Then Fresh & Clean designed a unit that would not only work for businesses but importantly for women as well. 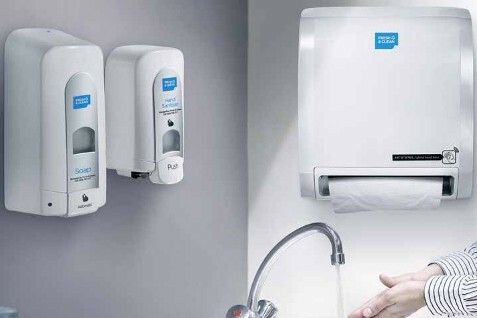 The Fresh & Clean range will ensure washrooms are clean, pleasant and safe places, providing confidence and peace of mind. It is the smart, hassle-free solution to Workplace Health & Wellbeing.